Android 8.0 Oreo, the current version of the mobile operating system from Google has made its debut on the Android distribution statistics chart. Here are the numbers for October 2017. Oreo has a paltry 0.2% share as of now, mostly because it is not officially available for devices other than the Pixel 1st gen Phones, and a few of the last Nexus devices. Hopefully it will pick up the pace soon with new devices like the Pixel 2 and Pixel 2 XL which are launching in a day from now. But the growth rate depends on OEMs updating existing devices to Oreo, which unfortunately is a sad state of affairs in a world dominated by mid-range devices from Xiaomi and other OEMs, who don’t update their devices quickly or at all. Its predecessor, Android 7 Nougat grew by 2.0% from 15.8 to 17.8% (7.0 and 7.1 combined) in a month. Marshmallow fell from 32.2% to 32.0%, but still holds the crown. Android Lollipop dropped from 28.8% to 27.7%, to sit in its 2nd place spot. KitKat fell below the 15% mark with its 14.5% shares, while Jelly Bean dropped from 6.9% to 6.6%. 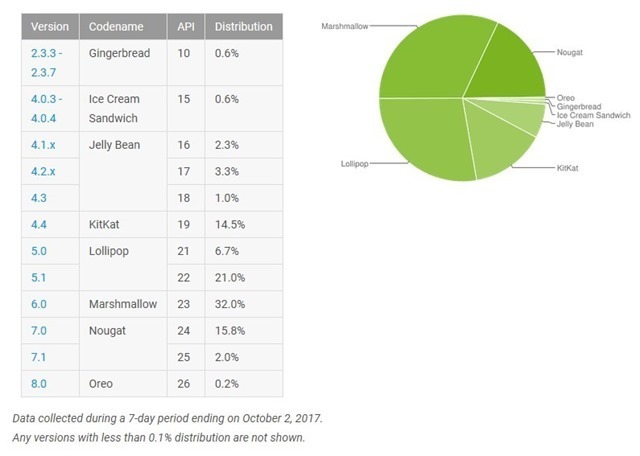 Gingerbread and Ice Cream Sandwich were stubborn to maintain a 0.6% share.